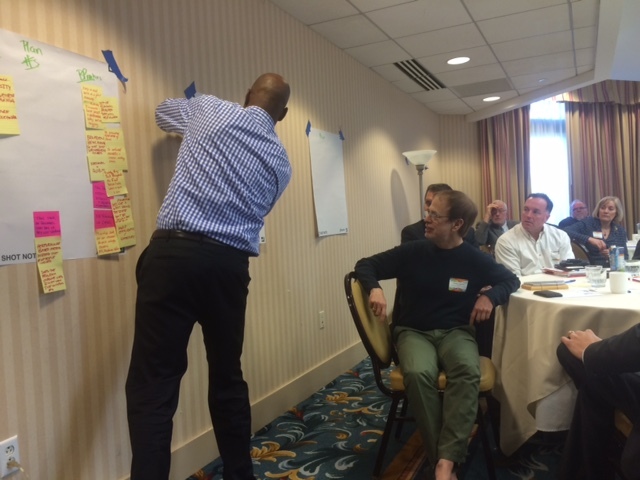 Kenya Rutland, a meeting facilitator, during a brainstorming session. Westbrook – It was inevitable. Suzanne Bates of the Yankee Institute, a conservative think tank critical of public-employee benefits, found herself at a table next to Daniel J. Livingston, the lawyer who negotiates those benefits for state employee unions. “I guess this is an ironic seating arrangement,” Bates said. The unlikely table mates were among 150 people from the worlds of business, labor, lobbying, economics and municipal government who gathered Thursday night and Friday at the Water’s Edge Inn for an economic summit, political mixer and brainstorming session. The meeting was organized by the Connecticut Conference of Municipalities, a venerable organization intent to play a bigger role in framing public policy, and co-sponsored by a true odd couple, the Connecticut Business and Industry Association and the Connecticut AFL-CIO. The goal was to reach a consensus on economic policies these disparate constituencies can stand behind to grow jobs in an economy that is improving, though more slowly than in the rest of New England. The backdrop is yet another fiscal crisis unfolding in the State Capitol in Hartford. Breakfast was served with a PowerPoint presentation about the Connecticut economy by Robert Triest, an affable economist and vice president at the Federal Reserve Bank of Boston. (Keith Phaneuf, the budget reporter for The Mirror, briefed attendees the previous night.) Then the participants split up into five working groups. The meeting had a “desperate times, desperate measures” vibe. If there was anyone in the room with a favorable opinion of the latest budget adopted by Gov. Dannel P. Malloy and the General Assembly, they were discreet. Rutland asked participants to say why they came. Michael Tetreau, the recently re-elected first selectman of Fairfield, introduced himself as coming from ground zero in the economic climate debate. His town is the corporate home to General Electric, which is noisily looking into relocating out of state. Eileen Hasson, president of The Computer Company, a web developer and data business based in Cromwell, said her motive for attending was provided by the General Assembly vote to triple the state’s data processing tax from one to three percent. It was quickly rescinded, and House Speaker J. Brendan Sharkey, D-Hamden, recently acknowledged that the impact of the tax increase – one of the final pieces of revenue to close a shortfall in the final days of the 2015 session – was little understood by lawmakers. Jennifer Jackson, the chief executive officer of the Connecticut Hospital Association, said she represents an industry whose annual tax burden is up by more than $500 million. Ned Lamont, the founder of a cable-television company and a candidate for U.S. Senate in 2006 and governor in 2010, said he would like Connecticut to be a state with the potential to attract his three young adult children, who are living in California and New York. Rutland told them to begin the brainstorming, urging them to throw out the ideas and issues quickly. They would be winnowed later. The tables worked together, jotting ideas on Post-It notes that could be arranged on large sheets of paper on easels and taped to the walls. “I just want to make sure we think outside the box a little bit,” he said. The ideas, issues and complaints came at Rutland in a blizzard of Post-Its: Better planning on the budget. Two-year budgeting is a failure. Best practices don’t exist. Legislators focus on the trivial. Regulations pile on year after year. Taxes are imposed unequally. With no fiscal stability, businesses cannot plan. Today’s unfunded liabilities are tomorrow’s tax increases. There is no cost-benefit analysis on regulations. No one from state government was in the room. Joseph DeLong, the new executive director of CCM, said legislators and administration officials were invited, but he was untroubled by their absence. The goal is to synthesize the suggestions of the working groups into an action plan to bring to Hartford with the backing of business, labor and others. Livingston, the labor lawyer, said the exercise was interesting, if only for the diversity of the participants and the civility of the discussion. But he was noncommittal when asked what it might produce.